Tiruchirappalli, fondly called as Trichy by Tamil speaking population is one of the important spiritual hub of South India. Trichy is the proud home of several historic religious sites that receives devotees from all over the globe, throughout the year. Some of the most popular religious sites of Trichy include Srirangam Sri Ranganathaswamy Temple, Basilica of the Most Holy Redeemer, Thiruvanaikaval Arulmigu Jambukeswarar Akhilandeswari Temple, Hazrat Nathervali Dargah, Our Lady of Lourdes Church, Rockfort Ucchi Pillayar Temple and so on. 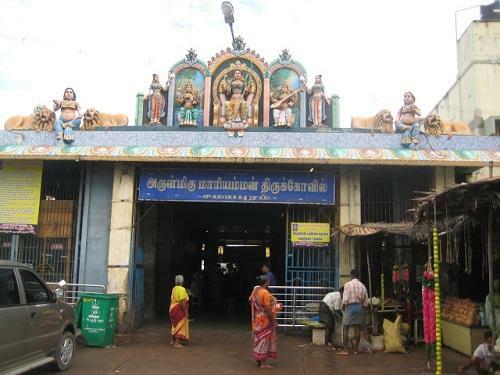 Samayapuram Arulmigu Mariamman Temple is one among the most important religious sites of Trichy. As a matter of fact, the name Samayapuram reminds of Goddess Samayapurthal to Tamil people. This illustrious temple is located in the modest suburban area of Trichy called as Samayapuram, just 16.8 km away from the city center of Trichy. 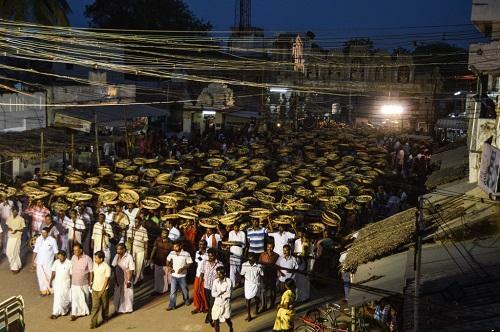 The temple receives thousands of devotees on a weekly basis, throughout the year, especially on Tuesdays, Fridays and Sundays. Touted as the second most affluent temple in the southern state of Tamil Nadu, Samayapuram Mariamman Temple is a must visit temple of Trichy. 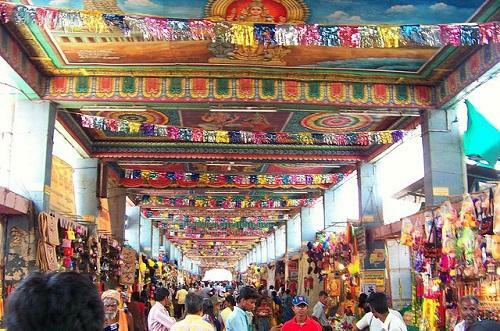 Tamil Nadu houses a lot of most sacred abodes of Goddess Mariamman. Samayapuram Temple is regarded as one of the most prominent abodes of Goddess Mariamman among the Shakthi temples located across the nation. The recorded history of this temple indicates that the present form of this temple was established by King Vijayaraya Chakkaravarthi during the early 18th century. However, it is widely believed that the local rural people of this region revered the Goddess for several centuries before the temple was even built. 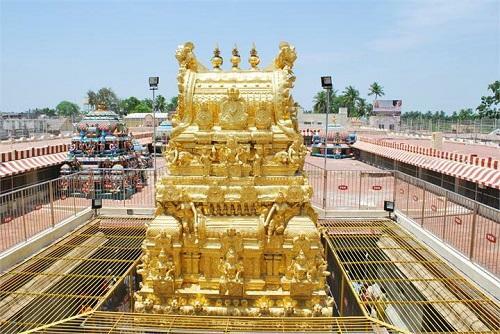 Legend has it that the presiding deity was actually from the Srirangam Sri Ranganathaswamy Temple! The temple priest felt that the Goddess idol caused him unwellness. He then asked to remove the Goddess idol from the temple. It is strongly believed that Goddess Mariamman, being a rural god has enormous divine powers that proper poojas, sacrifices and offerings to Shakthi should be made appropriately. 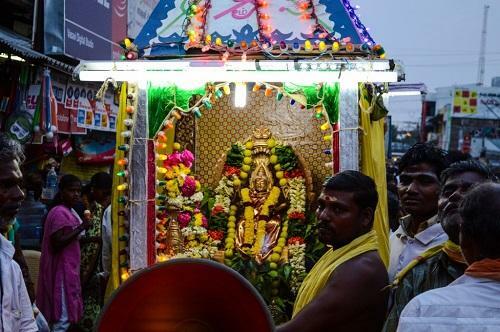 After being removed from Srirangam Temple, the Goddess deity was recovered by some people who went on to construct a proper temple and called it as Kannanur Mariamman temple. During that time, Trichy was governed by the rulers of the Vijayanagara Empire. The Vijayanagara rulers made a spiritual commitment to the Goddess that if they win the battle, they will develop the temple. At present, the Samayapuram Mariamman Temple is administrated by an independent trust supervised by Tamil Nadu government. 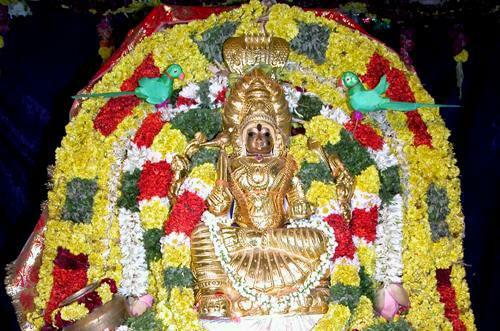 The presiding deity of the Samayapuram Mariamman Temple is devotedly called as Samayapurathal. The deity of Samapurathal is made up of clay and sand and hence the divine procedure of abhishekam (holy washing) is not performed. The Garbha griha (sanctum sanctorum) also houses a small stone structure of Mariamman for which abhishekams are performed according to the 'agama poojai vidhi'. In a way, Samayapuram Mariamman Temple can be called as a 'Parihara Sthalam' as the Goddess is regarded as the supreme power of curing diseases. In fact, people buying small metallic replicas of troubling human body parts and donate it to the temple to seek divine intervention in healing. Furthermore, people who are affected by Smallpox, Chicken pox and Measles visit this temple and stay inside the temple complex and pray for the blessings. The temple is equipped with a massive resting hall to accommodate the devotees who seek to stay for days together. The holy water collected during the sacred washing of the deity (abhisheka theertham) is splashed all over the body of sickly people for speedy recovery. Ardent devotees often perform Anga Pradakshinam in this temple to express reverence by rolling over through the prakaram in wet clothes. 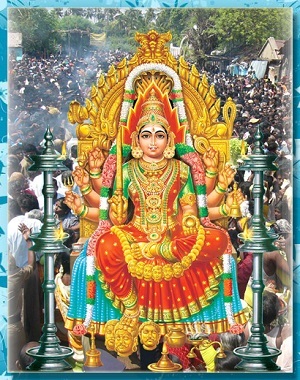 Goddess Smayapurathal goes through a 28 day fasting period for the well-being of human beings (from the last Sunday of Tamil month Maasi). Only fruits and some flour are offered to the Goddess as Naivedyam during her fasting period. Marking the completion of her fasting, a unique abhishekam is performed, that is, sacred washing of deity only with flowers. This occasion is celebrated as 'Poo Choriyal festival'.